The mission of Harvard Business School is to educate leaders who make a difference in the world. So how does sustainability fit into a mission like this? On May 19, 2016, I moderated a panel with professors from Harvard, Oxford and Cambridge on this topic. Here are the key outcomes of the discussion on integration of sustainability into education at the GRI 2016 conference. Sustainability needs to be part of management education, on that the panel and the audience agreed. But there were many visions on just how to do that. At Harvard, it is part of a mandatory leadership course. At Oxford, they strive to integrate it in all core subjects. And at Cambridge, there is a separate program for sustainability leaders. The audience of mostly academics was split evenly on whether it should be taught separately or integrated in all subjects. Richard Barker from Oxford clarified the challenge by comparing sustainability to finance as a subject. 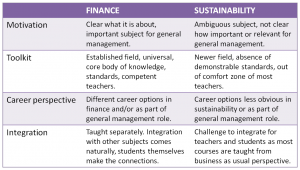 Sustainability is a newer field, creating uncertainty for both students and teachers. The business of business schools is business, so practice often leads teaching. As business increasingly integrates sustainability, so must business education. However, (research) faculty won’t always be the best teachers for this field. All panelists admitted that they regularly bring in practitioners from business to teach. As the moderator of this panel, I was happy to see how much had changed since my own years at business school in the ’90’s. No matter which of these programs a student would choose, they would be much better equipped as a future-proof leader. The big elephant in the room was: will their jobs straight out of B-school allow them to put this theory into practice? Will they be stuck playing the game of business as usual until they reach a position with enough influence to really act on the integration of sustainability? Will they have forgotten by then, corrupted by many years in the system? Or will they be agents of change long before then, starting their own companies as social entrepreneurs or choosing to work for companies with a clear vision on their role in creating a better world? Special thanks go to the great speakers on this GRI Conference panel: Richard Barker, Professor of Accounting, Oxford University; Wayne Visser, Senior Associate and Masters Tutor, University of Cambridge’s Institute for Sustainability Leadership and Karthik Ramanna, Associate Professor of Business Administration, Harvard Business School. Want to find out more about GRI’s 2016 conference? Check out #GRI2016 on Twitter and have a look at my earlier posts with key takeaways from the event and the verdict on the S-word. Written by Marjolein Baghuis (@mbaghuis) for Change in Context. 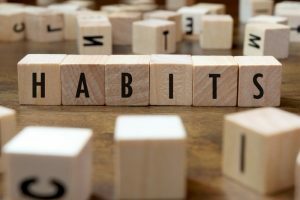 To read about interesting people, book reviews and other posts about sustainability, communications and change please subscribe.